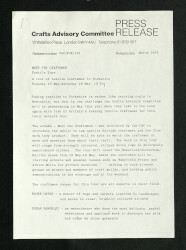 A4 invitational poster for 'Meet the Craftsmen: Textile Tour', a public event organised by the Crafts Advisory Committee from Tuesday 15 May to Saturday 19 May 1979. The poster features graphics by Ray Kyte, incorporating photographs of the five makers involved in the tour: Michael Brennand-Wood, Roger Oates, Geraldine Hubbard, Susan Rangeley and Kaffe Fassett. The text lists the dates and venues for the tour. A sticker indicating the library reference number is attached to the top left corner.